Currently browsing posts filed under "Michael Eisenson ’77"
I hope you are all enjoying the last days of summer, and looking forward, as I am, to the new academic year. As you know, President Adam Falk recently announced that he will leave Williams at the end of December to become president of the Alfred P. Sloan Foundation. In my role as chair of the college’s Board of Trustees, I have been asked by the Board to lead our search for Adam’s successor. I am writing today to inform you of our considerable progress in organizing the process, and to share with you our plan for interim college leadership beginning in January of 2018, which was approved by the Board of Trustees yesterday. First, I am pleased to inform you that Protik (Tiku) Majumder, Barclay Jermain Professor of Natural Philosophy and Director of the Science Center, has graciously agreed to serve as interim president, starting January 1, 2018, and continuing until the new president is in place. Tiku has an outstanding record as a Williams teacher and mentor, scientist, and faculty leader, and just as importantly has earned wide trust and respect across the Williams community. Our objective was to find an interim president with a keen understanding of our institution; a love of Williams, of its students, and of its faculty; enormous patience, tact, and insight; and an ability to respond with intelligence, compassion, and calm to the inevitable challenges that will arise from time to time. Tiku has each of these qualities, and many more. He will do a superb job of keeping Williams on track, and I ask you to join me in thanking him and supporting his leadership. Second, we have formed a Presidential Search Committee whose charge will be to present to the Board of Trustees one or more exceptional and thoroughly vetted candidates to become our next president, and to ensure that every member of the Williams community has an opportunity to give input with respect to qualities that we should be seeking, as well as to offer nominations. The Search Committee includes representatives from every sector of our community: students, staff, alumni, faculty, and trustees. Several members are also Williams parents. As their backgrounds indicate, each brings deep involvement with the College. Service on the committee will require significant time and effort, and I am personally grateful to the members for their dedication to Williams and their willingness to take on this essential task. Third, the board has retained the firm Spencer Stuart as consultant, to help manage the search process. Spencer Stuart has been involved in numerous recent and successful academic searches at the highest levels, and is very well positioned to help the committee in its work. Searches like this are complex and sensitive, and we expect to benefit greatly from their expertise, specialized resources, and pool of outstanding candidates. The Search Committee will begin its work shortly, and we will announce opportunities for community input as these are developed. As a first step, we have created a website where you can find information and materials related to the search. We will add to the site as additional materials are available, as further process steps are scheduled, and as we have news to share. Our future email updates will link back to this site as the place of record for search news. On behalf of the Board of Trustees, I want to again thank the members of the Presidential Search Committee for the work they are about to do, and Tiku Majumder for his service as interim president. I also want to convey to our entire community our enthusiasm and optimism as we set out to find the 18th president of Williams College. Be sure to spend more time on the testimony of Frederick Lawrence from the Senate hearings. It was telling that he did not contradict Sen. Kennedy in any way in the discussion of Falk’s unique approach to defending free speech (a la Ben Tre). Will do, later this week. Speculation regarding Falk’s departure is amusing, but the choice of the next president is a much more important issue. Some relevant questions: How does one communicate with the board of trustees, who will be on the hiring committee, etc. Is there any way Lawrence could end up on the committee? He is quite impressive. 1) The full search committee has not been announced yet, but trustee chair Michael Eisenson ’77 will be the chair. I think that I also read, but can’t find the link, that Isaacson, Miller has been hired to help, as they did in the last search. True? 2) It is unlikely that Fred Lawrence ’77 will be on the search committee, mainly because he does not live in Williamstown or Boston. A committee which draws all its members from those two locations will be much easier to manage. As I will discuss later this week, I like Lawrence for interim president. I wonder if he and Eisenson knew each other back in the day . . . I write, on behalf of the Williams College Board of Trustees and with mixed emotion, to officially confirm that Adam Falk will leave Williams at the end of 2017 to become president of the Alfred P. Sloan Foundation. The College has flourished under Adam’s leadership. We have sustained and, indeed, enhanced our position as a national leader in liberal arts education. We have maintained our commitment to providing access to the broadest possible spectrum of exceptional students, attracting ever increasing talent and diversity to our campus. We have had great success recruiting accomplished and highly sought-after new members to join our outstanding faculty ranks and, as well, Adam has built a deep and effective senior leadership team. Our campus is undergoing an ambitious, carefully-orchestrated renewal, with superb new facilities, including the Sawyer Library and a major new center for the sciences, positioning us for the next fifty years, while reflecting a purposeful commitment to managing our carbon footprint. Our alumni and friends have set the historic Teach It Forward campaign well on the path to achieving our ambitious goals, and the College’s finances are in all ways very sound. Adam has been an exceptionally fine president for Williams. He has demonstrated a keen ability to appreciate and retain the best of Williams traditions, while encouraging the College to grow through a genuine openness to innovation, always with the education and wellbeing of our students foremost in mind. His departure will be a loss for the College and our community, and I will personally miss his wisdom, his friendship, and his deeply thoughtful and principled leadership. At the same time, he will be leaving at a time when the College is as strong, secure and thriving as it has ever been and the Board of Trustees is completely confident that Williams will attract another exceptional talent to lead us into the next decade. Adam’s last day at Williams will be December 31, 2017. The Board has approved the formation of a search committee, and I have been appointed as its chair. In that capacity I will be back in touch later this Summer with information about the search process. We will organize various opportunities in the Fall for the community to thank Adam for his service and wish him well. In the meantime, please join me in congratulating Adam on his exciting next adventure and in making the most of his remaining time in the Purple Valley. Trustee Board Chair Michael Eisenson ’77 writes in the Record about climate change and green finance. Since Eisenson is speaking on behalf of the trustees and the Administration, we should spend a week deconstructing his article. Today is Day 2. The divestment movement at the College and at other institutions has inspired many to consider climate change more urgently and fully than ever before. In response, we are endeavoring to invest the College’s endowment in projects, companies and technologies that benefit the environment. As President Falk described in his letter to the campus earlier this month, we have already committed to significant investments in two solar projects that will enable a substantial reduction in fossil fuel use in Williamstown. The problems with this approach are the same as they have ever been: priorities, accountability and transparency. First, why is climate change more important than other problems, like police violence, war in the Middle East or income inequality? Climate change might — and even strong believers must allow some uncertainty, I hope — be a bigger threat on a hundred year horizon, but ending police violence (assuming it is possible) would save thousands of more lives over the next decade or two. Why spend dollars on public policy problem X and not on public policy problem Y? More importantly, why should Williams spend dollars on climate change rather than its fundamental mission of providing a quality education? Every dollar spend on solar power is a dollar not spent on financial aid or more faculty. The easiest way for the Williams community to reach agreement on priorities is for us to focus every dollar of spending and ounce of intellectual energy on our fundamental mission: To be the best college in the world. Everything else is a virtue-signalling distraction. Second, where is the accountability with regard to past Williams spending? Recall the College’s installation of solar panels almost a decade ago. That project was supposed to pay for itself in 10 to 20 years. Has it? If not, has the Administration learned a lesson? If not, why should anyone think that Williams, as an institution, is competent about spending money to fight climate change? Don’t forget that the absurd carbon offsets that the College bought almost a decade ago (here and here). The central point is that the whole carbon offsets business is 95% scam, a scam to which the College has fallen (willing) victim. We wanted to believe that, by writing someone else a check (especially a nice PC someone? ), we could reduce the amount of carbon that would have been emitted had we not written the check. But that check just went in to some hustler’s bank account. Where is the accountability? How much did the College spend? What paperwork did it receive? What follow-up was done? Thousands of dollars and all we seem to have gotten is a few feel-good lines in a graduation press release. Again, this is not an anti-Boyd or anti-Johns screed. I want Boyd to go from “Acting” to permanent Director of the Zilkha Center for Environmental Initiatives. (The College should do more to hire faculty spouses and promote from within.) I want Johns to work on my special projects, environmental and otherwise, for the College. (The more alumni that work for Williams, the better.) I am just tired of the College’s endless gaze into a green tinted mirror of fantasy. Amy Johns ’98 is now the (excellent!) Director of the Zilkha Center. I don’t (necessarily) blame her for the embarrassment of the Owl Feather War Bonnet — Not making up this name! I swear! — scandal, but there is no excuse for the College covering up what happened. (Great story for the Record, assuming that they have the cojones to stand up to the Administration.) We need an accounting of what the College has spent on climate change in the past. Third, if the College is going to spend money on items not directly related to its fundamental mission, it should provide complete transparency about that spending in the future. Are the Trustees committed to providing that transparency? Is the Administration? Please start with all the relevant details — including the budget and revenue projections — for these two solar projects. Trustee Board Chair Michael Eisenson ’77 writes in the Record about climate change and green finance. Since Eisenson is speaking on behalf of the trustees and the Administration, we should spend a week deconstructing his article. Today is Day 1. To the many members of the community who have urged the College to lead in the fight against climate change: Thank you. On behalf of the Board of Trustees, I want to express my appreciation for your passion and your conviction that the College must make a serious commitment to address this urgent crisis. 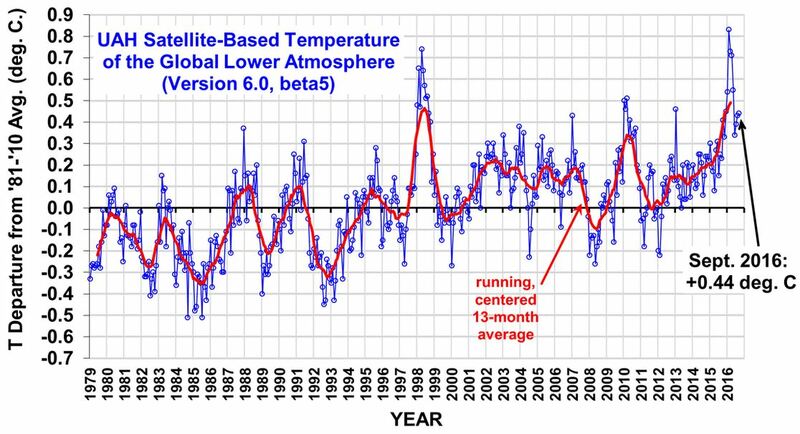 Is the Earth warmer today than it was five years ago? Definitely! EphBlog believes in data. But temperatures today are not meaningful different than they were in 1997-1998, almost 20 years ago. And “climate change” has been a crisis at Williams since at least the mid-80s. Recall that Professor Ralph Bradburd was hosting discussions about climate change in 1998! 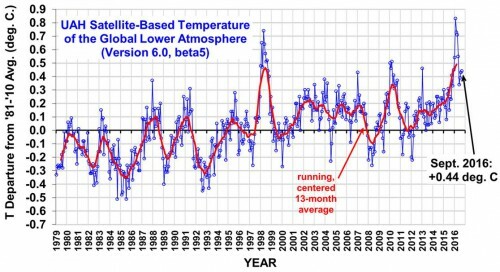 If we had told Bradburd, in 1998, that the average temperature in 2016 was going to be the same as it was then, would he still have claimed that there was a crisis? Perhaps. If I could guarantee than the temperature in 2034 would be the same as today, would you still think there is a crisis? Of course, I realize that these arguments are largely pointless. Trying to convince the Williams faculty/trustees that climate change is not an “urgent crisis” is about as productive as, in 1866, trying to convince the Williams faculty/trustees to doubt the divinity of Christ. So, I will spend the rest of this week arguing that, even if we accept the danger of climate change, Williams is acting sloppily. Contrary opinions welcome! EphBlog is powered by WordPress and delivered to you in 1.007 seconds using 33 queries..